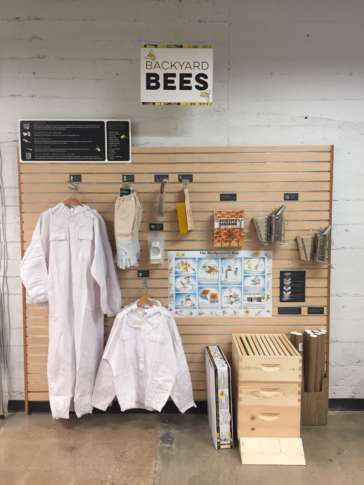 MOM's Organic Market's Alexandria store reopened Friday with an expansion that includes a backyard beekeeping section that sells all the tools needed to keep bees in backyard hives. WASHINGTON — MOM’s Organic Market’s Alexandria store reopened Friday after an expansion that increases the size of the store by 40 percent. And among the additions is a backyard beekeeping section that sells all the tools needed to sustain bees in backyard hives. “It is a new initiative of ours this year to put beekeeping sections in stores where we can,” MOM’s founder Scott Nash told WTOP. “We’re putting them in our stores to bring attention to backyard beekeeping and to show that anyone can do it,” he said. The store already keeps active bee hives on its roof. Nash, a beekeeper himself, also hopes the new sections will call attention to the fact that bees, crucial pollinators, are in trouble because of pesticides and other threats. About a half dozen of MOM’s locations now carry beekeeping tools. MOM’s plans several grand reopening events this weekend for its Alexandria store at 3831 Mt. Vernon Ave. including live music, local tastings, henna art and giveaways. The expanded store will also include MOM’s Naked Lunch counter, found in several other MOM’s locations, that serves organic and vegetarian food and a rotating growler station with limited-batch, seasonal beers. MOM’s is also donating 5 percent of grand opening sales to Potomac Riverkeeper Network. MOM’s, started as an organic produce delivery company in a Rockville garage, marked its 30th anniversary last month. The company has 17 stores in the D.C., Virginia, Maryland, Pennsylvania and New Jersey.